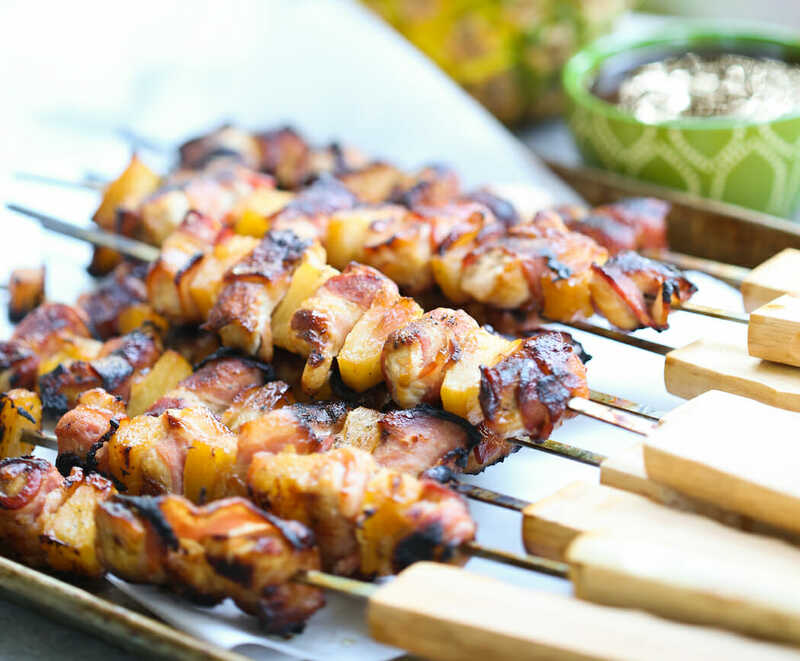 These Bacon-Wrapped Teriyaki Chicken Skewers are one of my favorite OG Our Best Bites recipes. I was planning on posting an amaaaazing new dinner recipe today and share this (made-over) post on Thursday, but then our site went down last week and there are still things that aren’t quite working right PLUS basically my whole family got influenza PLUS the same family is all in a musical this week. So. This is happening today and then I’m going to hide for about 5 minutes. This is one of my favorite fun foods, especially because you can serve it as an appetizer or as a meal. It’s a twist on Teriyaki chicken and you’re going to be pretty hard-pressed to find people, especially men, unimpressed by meat wrapped in meat and then grilled. And speaking of grilled, these can be done in your oven, but for the truly transcendental experience, they’re best on the grill. Yeah, I know, it’s March and not quite grill season yet, but I kind of believe that it’s always grill season, even when there’s snow on the ground. You’re going to need boneless skinless chicken breasts or thighs, bacon, and some of our amazing homemade Teriyaki sauce. Reserve 1/4 cup of Teriyaki sauce and refrigerate until ready to use. Remove the bacon from the package and while it’s still all stuck together, stretch it out a little (lengthwise). If you’re using center-cut bacon (and the “slab” is not as wide as regular bacon), just cut it in half. Otherwise, use kitchen shears to cut the slab into thirds. Place in a large pie plate or 9×13″ baking dish. Using kitchen shears, cut chicken into bite-sized pieces. You can gauge about how many pieces you’ll need by how many pieces of bacon you have–count the slices of bacon and multiply by 2 or 3 (depending on how many pieces you cut the bacon into) and then aim to cut about that many pieces of chicken. Add the chicken to the bacon, then add pineapple and cover in Teriyaki sauce. Cover and refrigerate for 8 hours or overnight. When ready to cook, wrap each piece of chicken in a piece of bacon and skewer. Top with a chunk of pineapple. 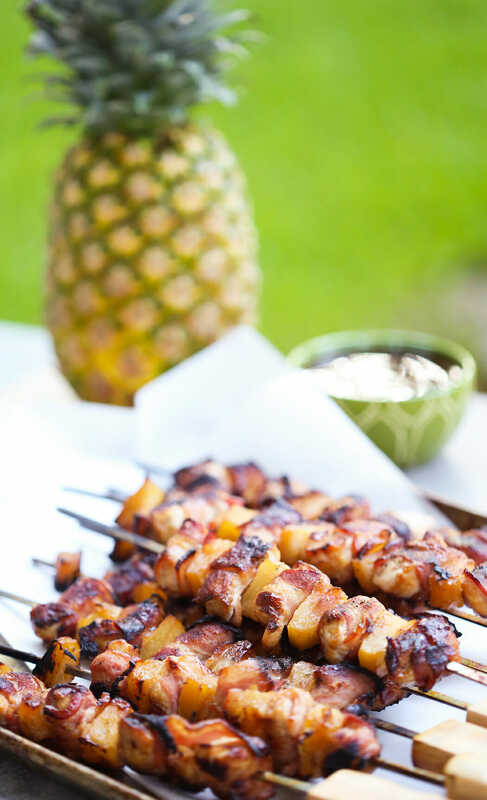 For appetizers, you can make these on toothpicks; for skewers, alternate bacon-wrapped meat with pineapple (3-4 per skewer). Preheat grill to 375-400. When hot, place skewers on grill and baste with reserved Teriyaki sauce. Cook about 7 minutes and flip skewers. Baste again and cook another 7 minutes. If grilling appetizers, use a grill pan if necessary to prevent them from falling through the grates. To make these in the oven, line a baking sheet with aluminum foil. Preheat oven to 400. Place skewers on baking sheet and and bake about 20 minutes, turning once, following the same basting instructions. Wondering what to serve on the side? Try Pineapple Cilantro Rice, Caramelized Green Beans, and Brazilian Lemonade for an amazing meal with tropical flair! 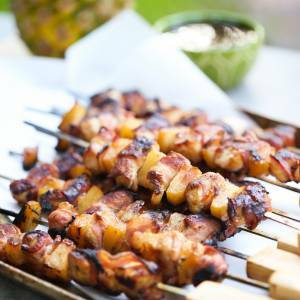 These Bacon-Wrapped Teriyaki Chicken Skewers are a surefire hit during grilling season, but they can be made year-round in the oven! I just hopped on a public computer to check directions for an outing tomorrow and I had to stop by here real quick too! Can I just say that this is one of my most FAVORITE things in the whole world?? Everyone has to make these right now. Tonight. Don’t delay. And skip the oven and trek to the bbq even if it’s snowing outside. These are like little sticks of heaven. LOVE them! K- back to work on my tan. See y’all next week! These look so good! I absolutely love the Teryaki sauce. I could eat it by the spoonfuls, well almost. This is a great meal for kids too. What kid doesn’t like eating food off a stick?! These look SO good. I will definietly be trying this recipe. I was just wondering what to make for dinner tonight, and I think I found the answer when I saw this in my Reader. Thanks for the recipe — they look delicious! You’re right about the guys…any meat wrapped in meat (especially when one is bacon!) will be an instant hit. We are going to try these this weekend while we still have good weather! Oh, man, my favorite pineapple and chicken!! Woo Hoo, have fun little lady! These look so good! I don’t cook on a grill; yet (hey; I’m a new cook and haven’t graduated to a grill!). I’ll have to get my husband to help, or i’ll try them in the oven. Thanks for sharing! These look so amazing! I am not a huge pineapple fan but I think I will have to make an exception for this, especially since there is bacon involved. YUM! For years I have been poking those little critters through tiny toothpicks. Tell me why I didnt think to put them on skewers? What a great idea. I cant wait to try your recipe. I am sure it will be a welcome update to my old tried and true. Blessings to you all for what you do. Mmmmm… This combines one of my favorite things (terriyaki chicken) with one of my husband’s favorites (BACON!). I agree about grilling them, now if we can just have some nice weather… notice my comment name – we’re from Oregon and are getting lots and lots of April showers! Have you tried these on a George Foreman? Susan, I haven’t, but I bet they’d be awesome. And if you don’t have a George Foreman but you DO have a panini press (like me), you could cook them in there as well. If you try it, let us know how they turn out! Kate! Move back to Utah immediately so I can be you official taste tester. It would be especially convenient if you moved next door, or somewhere in that vicinity. I always think how lucky your guys’ families are to get this yummy food after you’ve taken enough pictures. I’m going to have to pull a ‘Rachel Rae’ here and say, “Yum-O!! !” Those look awesome! OK Sara, I know you are dreaming that it is snowing here in Boise because it would make your trip more meaningful, but it is not! It is gorgeous! We were there this time last year and I am having seirous withdrawls, enjoy!!! This recipe looks fantastic, I just went and bought my skewers. Yummy. You can bet I’m bookmarking this one! This is fantastic, hubby loves teriaki and who wouldn’t love bacon wrapped chicken!! 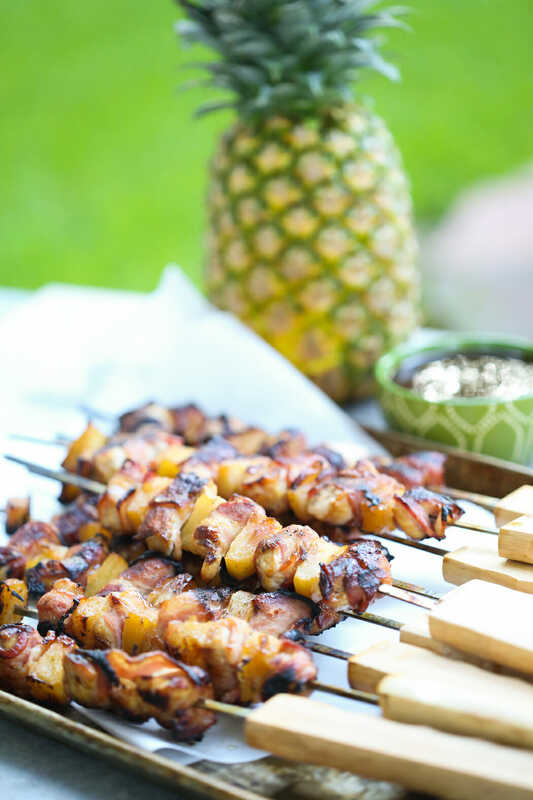 I thought that chicken teriyaki skewers were good, but add bacon and pineapple and they get even better! Great idea! Oh. My. Gosh. These are so good! I made them last night with the Pineapple Cilantro Rice and it was to die for good! If you haven’t made them, DO IT! I know I’ll be the envy of the neighborhood once the aromas from these babies start wafting – they sound fantastic! ooh, those do look de.lic.ious. yum! Mine are marinating in the refrigerator right now! Im anxious to see if my husband and kids will like them! They’re picky! I linked to this recipe, on my Menu Post this week! Thanks! I made these last week! Very yummy! Next time I just need to start them sooner so they can marinate longer. I made this last night and they were so so good! My boyfriend was thrilled- I cook a lot of vegetarian food, so grilled meat wrapped around more meat made him pretty happy. I only marinated it for 30 minutes or so, and they still turned out great. Perfect summer dinner recipe! I've had this recipe saved in my favorites on foodgawker for quite a while now and I finally made them last week. Soooo good! Well except for the part when I spilled the teriyaki sauce all down the front of myself when I was going back in to the house after putting them on the grill! Next time I''ll leave that part out. Thanks so much for the great recipes (this and all the others)! These were okay, but not as good as I was hoping. I don't have a grill so I baked mine, and I think they would have been much better grilled. After 20 minutes in a 400 degree oven, the bacon was not done, so I ended up leaving them in for an extra 10 minutes (and the bacon still didn't really get crispy at that point.) By then the chicken was pretty dried out, plus I think the pineapple made it mushy. Some of the chicken kind of just crumbled and turned to mush when I picked the skewers up with tongs. I will try them again if and when we get a grill. I had the same thing happen while baking them. The chicken that was closest to the bacon was pure mush! It was kinda gross! The inside of the chicken pieces were extremely dry. I LOVE this combination, so I will try it again, but on the grill instead. I don’t own a grill, but I’ve used my oven’s broiler like a grill many many times and it works great! It’s like grilling upside down! Preheat the broiler to high and place the skewers on a rack on cookie sheet. It’s how I make kabobs all the time. The cooking time will be similar to whatever grill times are in recipes. Enjoy! I made these last night with the rice and they were SO yummy! The weather was nice and we broke out the grill- which made them amazing. Definitely a new favorite around this house. Plus the rice was so good! These were AMAZING! I’m not really a fan of bacon (I know it’s a sin) but this was delicious! I’ve made these before, and now that it’s grilling weather, I’ve put them on the menu plan. I did them on toothpicks, marinating in a bag, and my pineapple turned all brown during the marinating. By the time all of the baking and marinating was done, everything was the same color. I’m wondering if I just used too much sauce? Thanks so much for posting this!! We tried it tonight and my husband said it is now a favorite of his. I doubled the recipe, as we have 5 kids that love bacon and chicken. Of course, this made more than enough and Mike has lunch for tomorrow! LOVED, LOVED, LOVED this!!!! Oh my gosh!! I want to eat this every day!!! I’d love for you to link up! First time I made them following the directions and the flavor was great but my bacon wasn’t crispy so we tried it again a different way with much better results. I skewered the chicken and pineapple on separate skewers and put the pineapple ones on the grill after the chicken ones had cooked a while. Then I cut the bacon into 1″ pieces and cooked in a skillet. Drained the bacon then combined everything back together in the skillet when they were all cooked. Not as fun presentation-wise since they weren’t served on the skewers but it was so tasty! I was having one of those, “Opps, it’s Sunday and I just invited a family over for dinner and I have nothing to make” moments. So I headed to this blog, (I always am inspired by it) saw this recipe, made my kabobs and marinated them during church. I didn’t have bacon, but had ham lunch meat instead and used half a slice per piece of chicken. It turned out so yummy! I baked them instead of grilling because the ham was a little delicate and I knew it would just fall off on the grill. I also made your cilantro/pineapple rice. Success in a pinch! Love it! Thanks ladies! This was an excellent recipe! They were a big hit . . . I’ll definitely make them again! THANK YOU! another great recipe! just made these for dinner. my 3 yr old couldnt get enough. (i can NEVER get her to eat meat.) thank you. These were SERIOUSLY delicious. Thank you! Any chance this can be FROZEN ahead of time? How many skewers does this recipe make? I’m serving this for my son’s granduation party. There will be about 50 people there. Is this recipe enough for 50 people? It really depends on how big you make the skewers and how much other food you have available. But I really don’t think this would be enough for 50 people, even if you made them as appetizers. If you’re serving this as a main dish, I’d multiply it by 8-9. Like another reader, my pineapple turned brown. Any way to prvent that? Also, do you need to soak the skewers before marinating the meat? I tried them and they taste amazing!! Thanks so much. If you’re using wood/bamboo skewers, definitely soak them. I’m not sure what’s going on with your pineapple, but it’s okay if it browns while cooking, that’s normal! I made these tonight on my George Foreman grill, just set it for 5 minutes and viola! I had no cilantro 🙁 so I made ginger pineapple rice yummmm!!! Made these for the 4th of July, my first experience grilling kebabs and they were absolutely delectable! Thank you! I made the Bacon wrapped Teriyaki chicken skewers because my daughter made them and she said they were delicious. I also made the Caramelized Green Beans along with the Lime-Cilantro rice with Pinapple, which were the suggestions to serve along with the skewers. This was my first time to make them and serve them to guests, it was all a hit and very flavorful. Definitely I would make again and want to try more recipes from Best Bites. I just want to personally thank you for all these wonderful recipes. My grand-daughter is having a party at the beach and I was completely lost on menu wise. So I found your sight and to my amazement I was able to come up with the whole menu for that birthday party..and few other other dishes for future occasions. I love these! However, next time I am going to use a BBQ grill pan. Just dump in the ingredients and stir over the grill. KISS is my motto. Sorry, I forget to mention that I made this into freezer cooking packets. Cut up the meat into individual baggies, the bacon in another baggie. Write a note on the pineapple cans and the teryaki sauce that they are needed for this recipe. Voila! Thanks for this great recipe (and many others!). How do you keep these warm in the crock pot for a pot luck? Like a party in my mouth! This was insanely delicious. I’ve been a OBB fan for a long time and actually make a lot of your recipes as freezer meals… This one included. But I couldn’t wait for this recipe so it didn’t make it into the freezer… We had it right away. Just one (pretty major) issue. Mushy chicken 🙁 boooo! I looked it up and sure enough apparently it’s a fairly widely known fact that the acidity of pineapple will destroy your chicken and make it mushy! 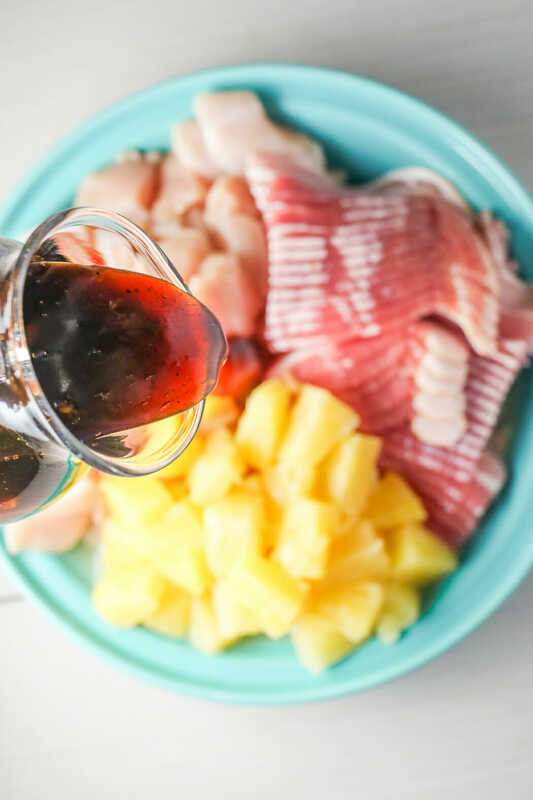 Anyway… I will still make this recipe over and over… I could practically drink that amazing teriyaki sauce…but will skewer the chicken and pineapple separately. I recommend using fresh pineapple. Yum! Made this tonight and it was so good that I had to comment. No problems with mushy chicken here! I u did leave a bit of space between each bacon-wrapped chicken chunk and piece of pineapple (maybe 1/4. in) and only had time to marinate for 4 hours. Really delicious! The teriyaki sauce was perfect. I topped it with toasted sesame seeds and served with brown rice and sautéed sugar snap peas. This is easily one of my favorite recipes on the planet. The only thing I do differently is that I prefer to cook them over indirect heat on my charcoal smoker. It takes longer – at least 45 minutes to an hour – but the chicken gets infused with the bacon fat and it is soooo tender. The teriyaki sauce recipe that accompanies this is also excellent.